An image of an office space in the gut-renovated project at 456 Johnson Ave., which is targeting firms with workers in Brooklyn areas like Williambsurg, Bushwick and East Williamsburg — who would have too much trouble getting to work if the L train tunnel shuts down between Manhattan and Brooklyn. BROOKLYN — If the L train’s tunnel connecting Manhattan and Brooklyn shuts down for a prolonged period of time — as is currently being discussed by the MTA — you can expect rents in neighborhoods along the line to dip, brokers said. The areas hit would include Williamsburg and Bushwick. But nearby neighborhoods that have easier access to other modes of transit — such as Greenpoint, South Williamsburg and Bedford-Stuyvesant — could see rents rise as would-be L train riders seek alternatives, said Jeffrey Schleider, a Williamsburg resident and founder of Miron Properties. 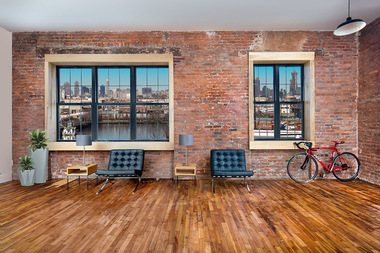 “I expect renters [along the L train] to pull back from the market pretty quickly,” said Schleider, whose firm represents hundreds of new rentals in Bushwick and Williamsburg expected to hit the market in the next one to three years. “It will drive prices down. But for Greenpoint we see little risk" since it's near the G train that provides access to the 7 train to Manhattan. He predicted that rents could rise in South Williamsburg, which is near the J/M/Z, and Bed-Stuy, which has the J train as well as the A/C and G trains. The MTA has said it needs to do repair work to the L-train’s Manhattan-bound and Brooklyn-bound tunnels, both of which were damaged by Hurricane Sandy. The agency has not yet released a specific timetable for the work, but a spokesman said Wednesday that it would take 18 months if they do a full shutdown and about three years if the MTA did one tunnel at a time. Though it’s not clear yet what will happen with the subway service, brokers agree that any type of closure will have an impact. Karla Saladino, managing partner at Mirador real estate, said many foreign buyers looking for new development outside of Manhattan as investments to rent out will likely avoid buildings along the L train corridor. Many are already opting for Long Island City instead, she said. While the residential market along the L train might be detrimentally affected during a tunnel shutdown, there is a silver lining when it comes to real estate: the area’s growing office space market. Chris Havens, of CitiHabitats, said with many people working in Brooklyn who already live there, the L train shutdown might not hurt these projects. “It’s an issue to have the L train slowed down and it’s frustrating, but the smaller office space is dependent on [residents from] nearby neighborhoods,” said Havens, who is marketing the new gut-renovated office project at The Paper Mill, at 456 Johnson Ave., a few blocks from the Morgan Avenue L train stop. “We are pitching this building to Williamsburg, Bushwick, East Williamsburg," he said of the 55,000-square-foot building that's focusing on firms looking for small space, from 900 to 2,200 square feet. While closures will most certainly have an immediate impact on rentals, experts said they don't expect it to hurt long-term values for property. The crisis could also propel a much-needed solution for the lack of public transit alternatives in the affected areas, real estate observers said. “There’s a larger transportation issue,” Schleider said of the notoriously packed L train. Schleider, a car-owner, also anticipated that road traffic, especially over the Williamsburg Bridge, would be “pretty messy." If the MTA were to replace service with shuttle buses, there would be so much Manhattan-bound road traffic that another bridge over the East River would be needed to fit it all, according to data and maps released by CartoDB. A coalition of politicians, business owners, developers and community groups is demanding the MTA give answers sooner rather than later on what will happen. “We're in discussions with elected officials and communities affected, as well as internally, about the best way to do it,” Fernando Ferrer, vice chairman of the MTA, said Wednesday at an MTA board meeting.